My boyfriend husband is taking off for Germany for the next few days for a snow sports tradeshow. While I am going to miss his company dearly, I am super excited for his trip. I attended this tradeshow several years ago, and it was a pretty unique experience. However, I hate being home alone, so I have to keep myself very busy. Whenever I take a weekend off from snowboarding, I tend to bake and photograph like crazy in an attempt to get ahead for the next few weeks. It is always easier to bake and photograph when I am home alone though. I don’t have to worry about the cleaning up the mess right away. Ya feel me? 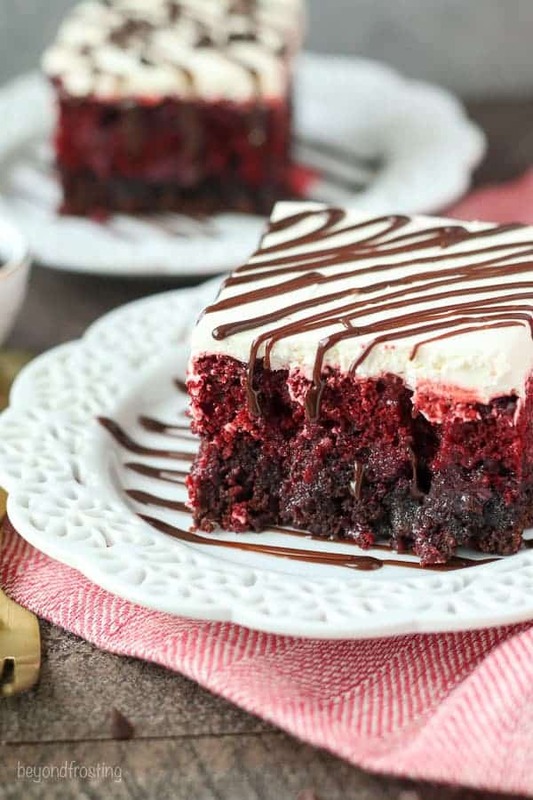 Last weekend, I made this Gooey Red Velvet Brownie Cake with a cream cheese whipped cream frosting. This cake it pretty bitchin’. It’s like a poke cake in that you poke holes in it and empty a can of sweetened condensed milk over the top. 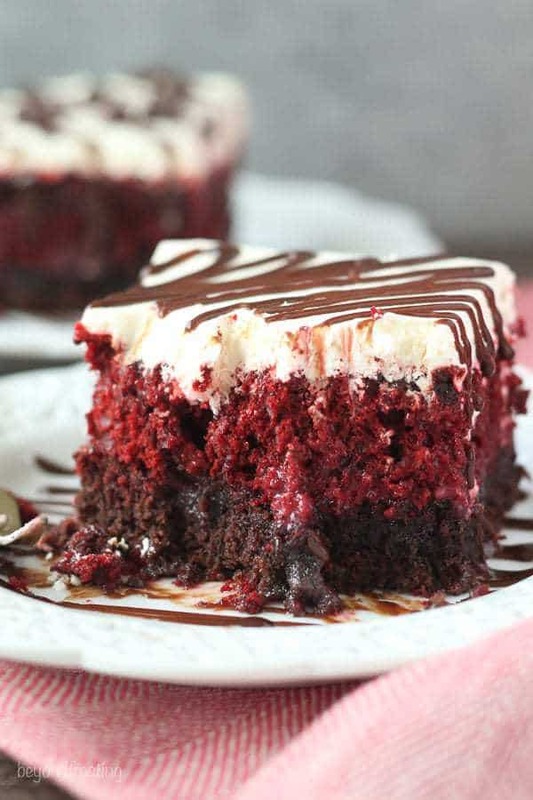 However, the actual cake is made from both a red velvet cake and a batch of brownies. The original idea I saw from Shelly at Cookies & Cups. Who knew you could bake a cake and a batch of brownies in the same pan, at the same time? Low Calorie, this is not, in fact I am pretty sure this is the exact opposite. 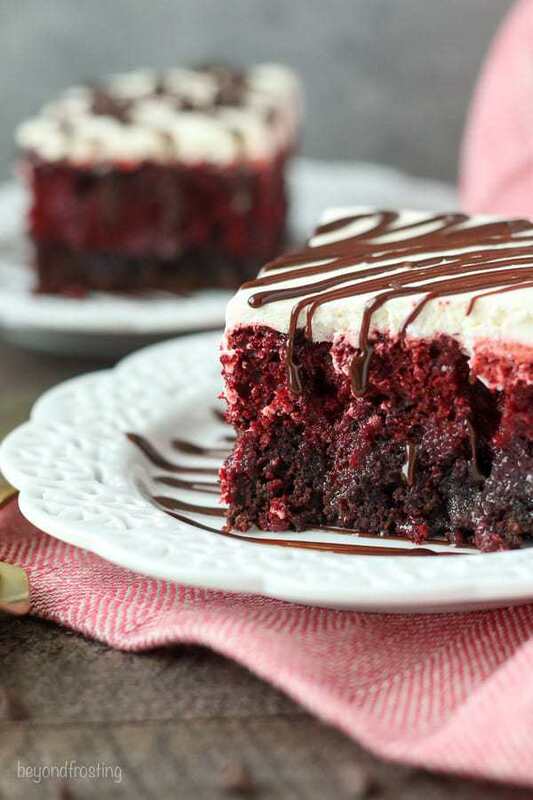 This red velvet brownie cake is topped with a cheesecake-like frosting. It really isn’t a frosting though, as it does not contain any butter or powdered sugar. 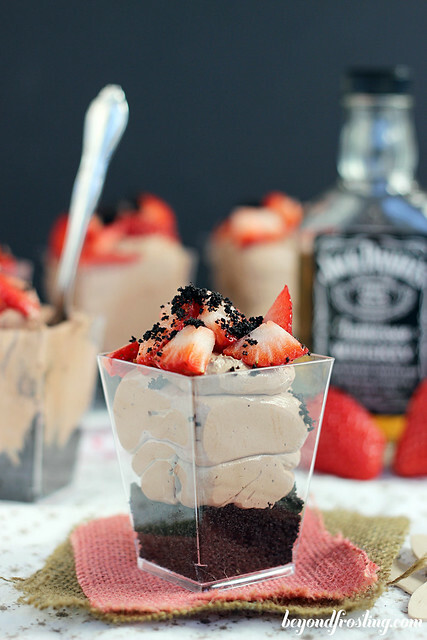 It more like a no bake cheesecake on top of the cake. You’re welcome. 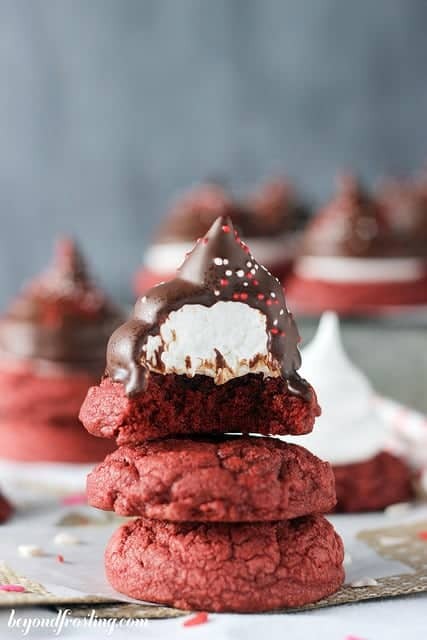 It’s fairly simple as you only need some cream cheese and Cool Whip (or homemade whipped cream if you prefer). This cake is soaked in sweetened condensed milk. I do not recommend skipping out on this, because you will need to keep this cake soft after it’s been refrigerated. Plus the sweet milk makes this cake have extra gooey amazingness. 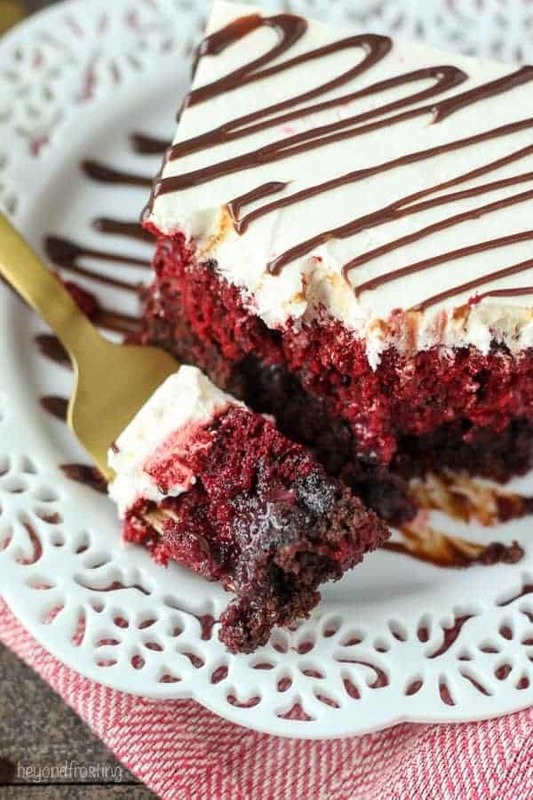 Don’t you just want to sink your teeth right in? Since you are baking a lot of batter with the cake mix and the brownie mix, the baking time is extended. The first time I baked this for a little more than 30 minutes, it came out too dry. The second time I baked it for 28 minutes and it seemed to be just about right. 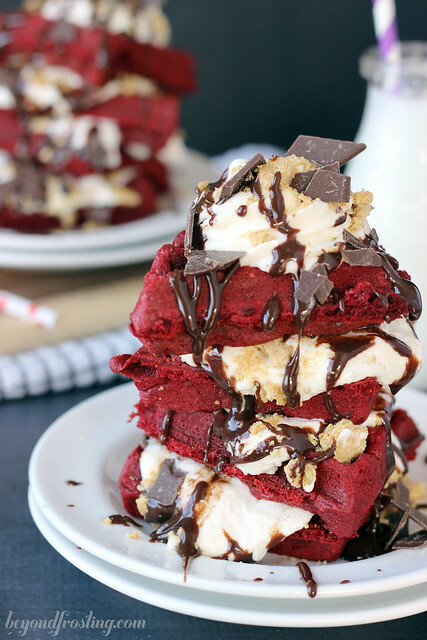 However, the cooking time will vary by oven and remember that you are baking both a red velvet cake and a brownie at the same time! Due to the fudginess of the brownies, not all areas completely set. I noticed that as it cooled, the cake set even more. Poke the cake while it is still warm and pour the sweetened condensed milk over the cake! Once it soaked in, it creates the magic. 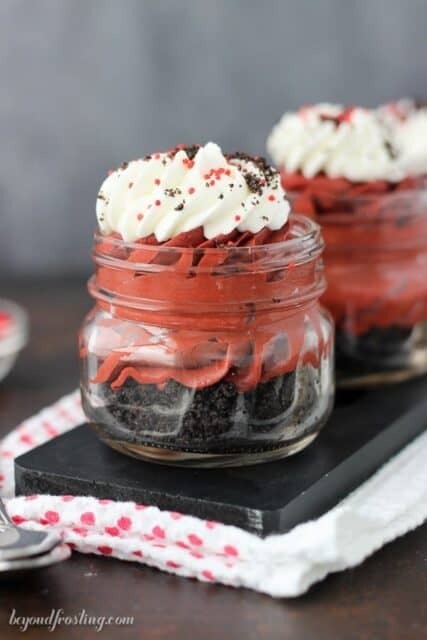 In a mixing bowl, combine red velvet cake mix with ingredients list on the box. Mix well until all ingredients are combined. Pour batter into a 9”x13” pan. In a mixing bowl, combine brownie mix with ingredients listed on the box. Mix well until all ingredients are combined. 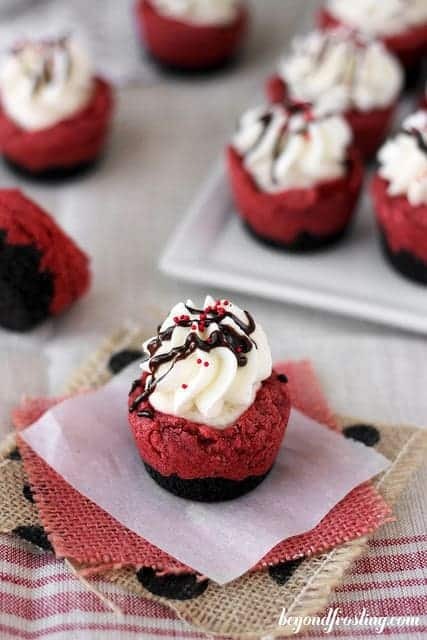 Pour brownie batter over top of red velvet batter. Bake in preheated oven for 30-35 minutes. Remove from oven and allow cake to cool for at least 30 minutes. While cake is cooling, prepare the chocolate cream cheese topping. In a mixing bowl, combine the cream cheese cream and whipped cream. Beat on medium speed for a few minutes until well combined. Spread over the completly cooled cake. Garnish with hot fudge. After adding the cheesecake frosting, the cake must be refrigerated. Will this cake taste good and not be too soggy if I make it the night before and serve it after lunch the next day? Hi Alice, it is considered a “wet” cake since its soaked in the sweetened condensed milk. Hi, just wondering if the cake is supposed to be cooked through or if it will be jiggly still? After 35 min the center of my cake was still quite jiggly. I am cooking it longer and hoping it doesn’t get too dry🤔 Thanks! 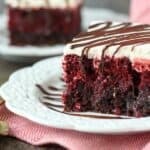 I am am making this cake for my husband for his birthday as he loves red Velvet and also fudgy brownies. Awesome Rachel!! I hope you enjoy! Can you please clarify if the brownie or cake goes on bottom? 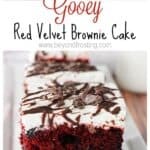 Your picture shows brownie on bottom but recipe says cake. I followed the recipe and had issues with the cake being done. It doesn’t look very pretty. Getting ready to frost and hope it turns out ok! Hi Jill, the cake mix goes in first and the brownie mix on top, you can also refer to the video to watch this! The brownie mix is thicker than the cake mix, so most of it will naturally sink to the bottom as it’s baked. Which is why you see in the photos that the brownie appears to be mostly on the bottom. This has become one of our favorite cakes! I’m making it again for Valentine’s Day. I’m keeping the chocolate in the frosting, though-we love it that way! Stop with the cool whip please! it is not a food should NOT be eaten by anyone. People do not understand it is a chemical with no real ingredient it will cause harm even in “moderation” I beg you to stop. Hi Eileen, I offer it in my recipes because for the same number of people who dislike Cool Whip, I get equal number of questions asking if Cool Whip can be used instead. Some people choose to use it for ease of use but also some people in more rural areas chose to use it because it’s more accessible and can be stored frozen.